A couple months after Bennett’s Chromosome 18q- diagnosis three years ago, Blake, Bennett and I travelled to San Antonio, Texas for the annual Chromosome 18 Registry & Research Society conference. We wanted to learn more about his condition and meet other families going through the same thing. But at the time — partly because his diagnosis was so new, and partly because his symptoms were somewhat different from other 18q- kids (he has mostly developmental delays that express more like autism, than health problems or visible disabilities) — we left that conference feeling unmoored. Like we didn’t quite fit in with the chromosome crowd or the autism people (Bennett’s autism diagnosis preceded his genetic diagnosis by six months). 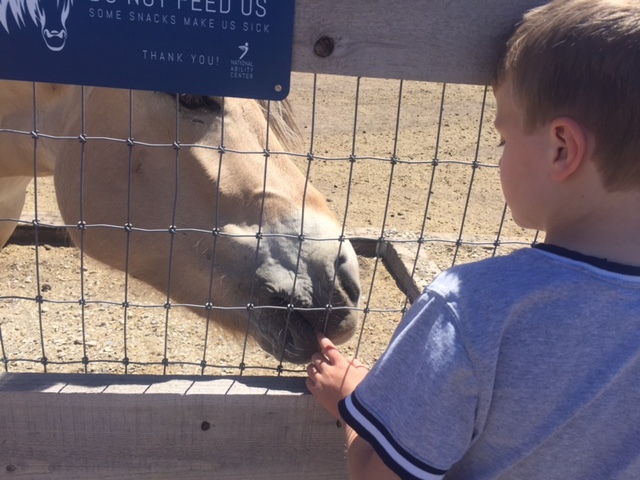 Bennett’s love affair with horses continues during a Chromosome 18 field trip to the National Ability Centre in Park City, Utah. But we decided to try again. So we drove to Salt Lake City in July to attend this year’s Chromosome 18 conference. We brought both Bennett and Avery with us this time, thinking Avery, now 10, would get a lot out of it and expand her knowledge and understanding of Bennett, and empathy toward him and other children and adults with extraordinary needs and challenges. This time, it felt right. 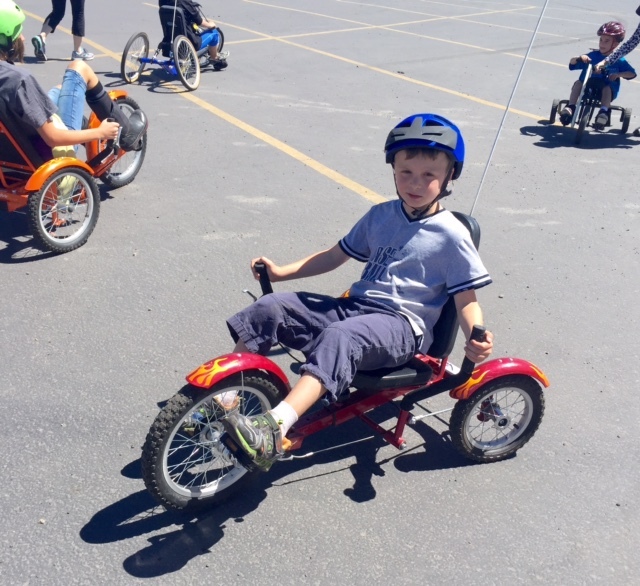 Bennett and other children with Chromosome 18 conditions try out a range of adapted bicycles on a field trip to the National Ability Centre in Park City, Utah. I sought out families with 18q- kids similar in age to Bennett. I asked questions about behavioural issues, challenges, schooling and medications. I attended workshops on autism in children (it’s quite common in 18q- kids), and anxiety and depression (also common). And I listened and really opened my eyes when photographer Rick Guidotti gave his presentation, Positive Exposure, on capturing the beauty in people with genetic differences. I saw this same presentation three years ago, but I didn’t really see. 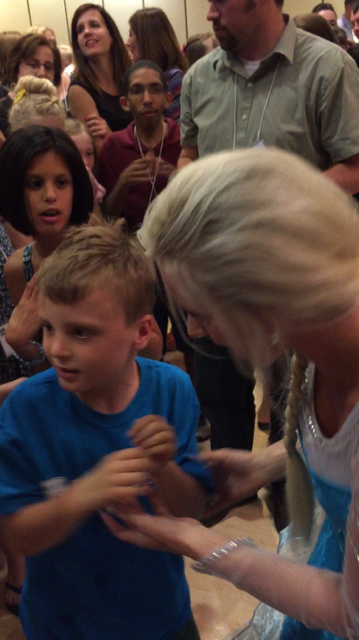 Bennett gets a hug from Elsa at the Chromosome 18 Registry & Research Society conference gala dinner in Salt Lake City. But Avery saw it immediately — that’s the beauty in children. She embraced the conference with her whole heart, making friends with other siblings and helping affected children, whether riding bikes with them on a field trip to the National Ability Centre in Park City, pushing a new friend on a swing, or giving hugs. There was a “sibling track” at the conference that explained Genetics 101 to brothers and sisters of affected kids, and let them talk about how having a special needs sibling impacted them. I realized Avery doesn’t see Bennett as having special needs; she sees him as her brother and loves him unconditionally. 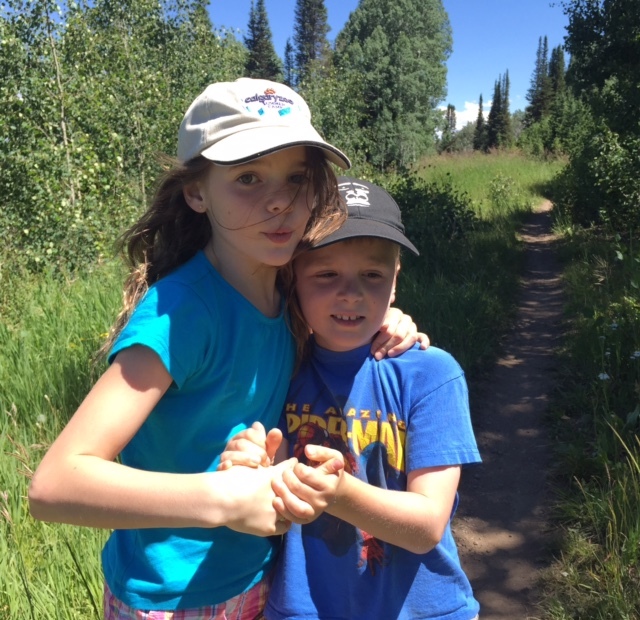 Avery is Bennett’s sister, mentor, protector and friend. It’s wonderful to see the kind, loving, empathetic and beautiful person she is becoming. 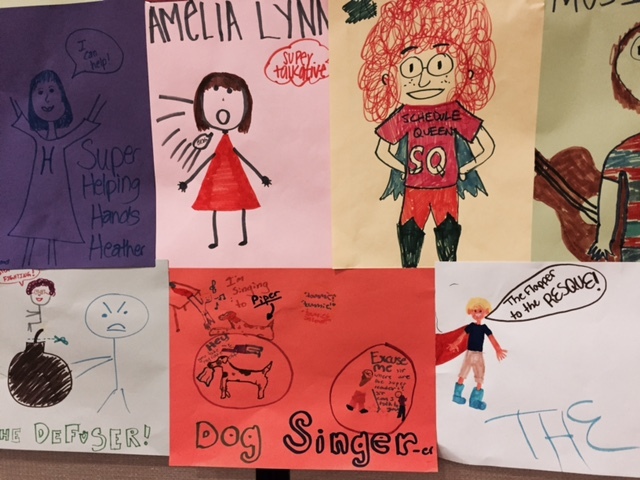 In which siblings draw their Chromosome 18 sister’s or brother’s imagined superpower, from their helping hands to their ability to adhere to strict schedules. It was another way for the siblings to think about their brother’s and sister’s strengths. Just as many of the Chromosome 18 kids aren’t superficially “beautiful” when viewed through a conventional lens, neither do they necessarily possess conventional abilities like “good at math” or “good at sports.” Bennett really excels at bugging dogs — in part because he loves dogs and that’s how he expresses it. He has perfected the genuine belly laugh too, and he’s tops at jumping on the trampoline. He’s also good at swimming and watching Super Why. Part of what makes those things his “powers” is that he truly enjoys them. And that’s what really matters — Bennett is happy. So many of these Chromosome 18 kids are happy, and they are so, so loved. And that is beautiful. Looking back now I realize it was my issue that I felt out of place at our first conference in San Antonio. Three years ago, I hadn’t come to terms with Bennett’s diagnosis. I hadn’t accepted it or owned it. I think I felt that he could somehow still be cured and returned to “normal” rather than simply treated. I wanted a magic pill that he could swallow, that would fix his broken DNA. I realize now that I was one of those people who saw physical differences and disabilities and became uncomfortable. No matter how I framed it, I had a hard time seeing beauty in difference. Instead of seeing possibilities I saw only challenges. Of course I loved Bennett. But I didn’t love his genes. I’m not sure when my perspective shifted; it happened some time between writing an essay for Swerve and writing a personal piece on living with autism for Today’s Parent two years later. In the Swerve piece I am still filled with despair, while the Today’s Parent story radiates hope. That’s not to say every day is a love affair with his genes now — they are still challenging, but like a pair of Levis that gets broken in over time, they are a much better fit for our family. At this conference I saw families living with a range of genetic configurations, but each child fit into his or her family, and each family was doing its best, loving its hardest and celebrating the beauty in difference. And that — combined with more research through this amazing society — will help these kids reach their potential, whatever it might be. Forget dog singer. Maybe one day Bennett will be a horse whisperer. 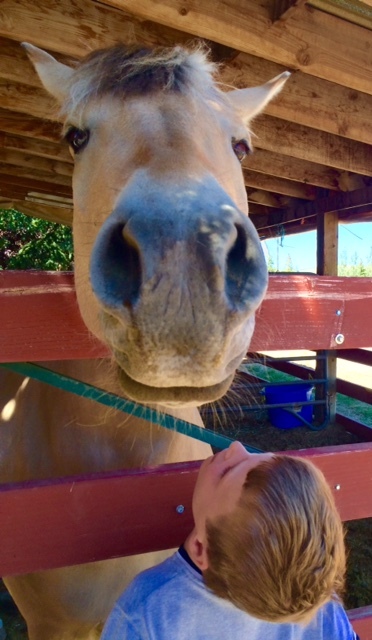 Bennett has a moment with a horse at the National Ability Centre in Park City, Utah. This entry was posted in Parenting, Travel and tagged 18q-, chromosome 18 abnormality, Chromosome 18 Registry & Research Society, Living with autism. Bookmark the permalink. I loved reading this. You sound like you are a wonderful mother and that your family truly enjoys one another. I especially liked how you said your daughter doesn’t see your son as having “special needs.” he is just her brother. Kids are great, aren’t they? Thanks, Jill. Kids are the best! Well written. Such a personal issue. Thanks for sharing.